The Link is dead. Long live The Link. Staff members at PIH Whittier moving mom from the ER to the regular hospital. While I’m confident there are plenty of peeps in our CSU FLC who have lots more responsibility than me, I have been on overload recently: my mom took a bad fall, broke her hip, shattered her shoulder, and had 2 surgeries, one to repair the hip, and one to replace the shoulder. And then I wound up with bronchitis. And I’m dogsitting mom’s adorable but slightly neurotic chihuahua Tiki. The dog did eat my homework a little bit. Poor Tiki suffers from separation anxiety. This door was blue when I left for CSU Long Beach in the morning. And it looked like this when I got back at the end of the day. I owe an apology to whoever on the waiting list could have taken my space. And an apology to my classmates who didn’t get the participation from me that they deserved. I’m turning my apology into this post because I want my FLC Classmates to know that while I’ve left a lot of learning on the table, I have nonetheless managed to learn a lot from all of you and my class is already different and improved because of you. In recent years I’ve tried to move further and further away from one-to-many, top-down pedagogical approaches. I should acknowledge the School of Art’s graciousness in allowing me to redesign the course pretty much every semester. I’ve tried a lot of experiments. Most of them a little to a lot successful. With the occasional bomb. For the past 3 years I’ve been using the CSU Long Beach, School of Art, Art Gallery Complex as our “classroom” on Thursdays. The SOA has a large group of compelling MFA and BFA students. Apparently more students study art and design at CSULB than any other public university in America. About 17 years ago the School of Art underwent a large remodel & rehab. The crown jewel of this is a large, 5 art gallery complex surrounding a large courtyard. All those MFA & BFA students have been lucky to have this incredible exhibition space. New shows are mounted weekly, yielding 65-70 shows every semester. I don’t know of any other university with such extensive facilities or such an ambitious exhibition schedule. The student artists have been tremendous recipients of this wealth of facilities. 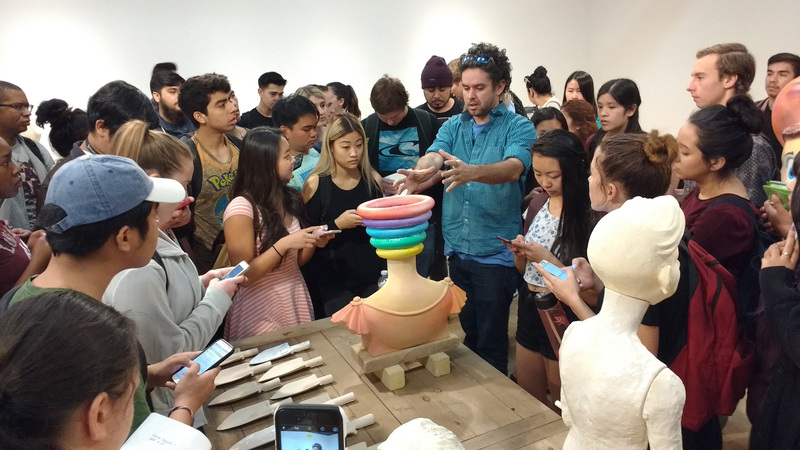 My students in the CSU Long Beach, School of Art’s Max L. Gatov Gallery with artist Samuel Jernigan as he talks about his ceramics exhibition. For a long time I wondered about my GE students from 65 different majors across the university community. Shouldn’t there be a way for them to benefit from this resource too? For the past 3 years we’ve done this by moving from a large lecture hall to the SOA Art Gallery Complex on Thursdays. Students have conversations with artists, enriching both I hope, and then they write about the work on their personal blogs/ePortfolios. I think these encounters have been very successful. Ironically, this great Thursday solution has highlighted how oldschool our Tuesdays have continued to be. I’ve tried a variety of formats for Tuesdays, but none of them have been successful on the level of Thursdays. This semester I’ve decided to finally, fully take myself out of the lecture business. Tuesdays are now discussion days. 127 students discussing in a large space is tricky! It’s been somewhat successful, but not entirely. Each week we mix up new groups of 6 students per group and have them consider pairs of artists. The student insights on these artists have often been superficial. Years ago I gave Green Book exams and they were often painful to read. The technology may be fancier and networked, but my freshmen non-majors are still a tough group to pull critical thinking out of. This is the 1st time we tried to organize 127 students into 21 discussion groups of 6 students each. I hadn’t fully thought through how everyone would find their group members. Students used their laptops & phones, here showing #14 & #6, to help their groupmates find them. It’s gotten a lot smoother since then. What our CSU FLC has made me realize is that I’m not doing enough work on Tuesdays! Yes I’ve worked hard to design a course that’s useful, educational, informative, fun, and engaging. In many ways we’ve succeeded. But Tuesdays remain the day that shows in sharp relief just how critical their thinking isn’t. If I’ve learned anything in the past 11 years, it is that if students in the aggregate are not performing in the way, or at the level that you think they should be, you don’t need to change your students, you need to change your methods. Sometimes easier said than done. But true. The discussions on our CSU FLC Moodle boards have prompted me to put more effort in on developing prompts and questions. It’s about a 45 minute drive from my house to campus and I’ve found that this is a pretty good time for me to think through discussion prompts. I can’t say that the results have been spectacular, but I can tell you that the students are at least a little bit more engaged and thinking critically. In these last 6 weeks I’ve also realized that my examples don’t always have to feature artists that are important, but arcane to the larger culture. I like having students think about the work of artists like Eva & Franco Mattes because it is so powerful and so of our moment. And I have to confess that while my colleagues in the School of Art probably never think about what I’m teaching, I still imagine that if they were looking, my content would seem contemporary and urgent. Nonetheless I’ve realized that sometimes you can get more critical thinking and art ideas out of your students if your example is Harry Potter! Student sharing his group’s ideas with the class. Oh, and a little exciting news! After all these years of F2F and Online, next semester the SOA is reorganizing my course as a hybrid course. Instead of two F2F days of class it’ll be just one day of F2F, plus online. Instead of 130 students, it will be 2 sections of 65. The F2F day will be at the galleries, and the online component will be Art Activities & Discussions. So far I’ve found better discussion in my summer online class than in the F2F class. Online feels like a great space for critical thinking. Especially with a compelling platform like Slack. I’m optimistic that this might be an ideal mix for our Southern California students here in 2016. A 16 week semester was probably always long, but it’s really long in the 21st century. Many students don’t want 2-1/2 hours a week of F2F class. But so many do want some F2F interaction with their peers and with the instructor. I’m anticipating that for many students a hybrid class will best fit their lives, schedules, attention spans, and new media realities. A big thank you to my CSU FLC colleagues & facilitators. My participation left so much to be desired. Still, I want you to know that it’s been great, even if light on my end. The course prompts and the class discussions have made me think more about critical thinking. After 11 years I’m still searching for ways to motivate my 130 freshmen non-majors to dive more deeply into Art, and into their own lives and careers.